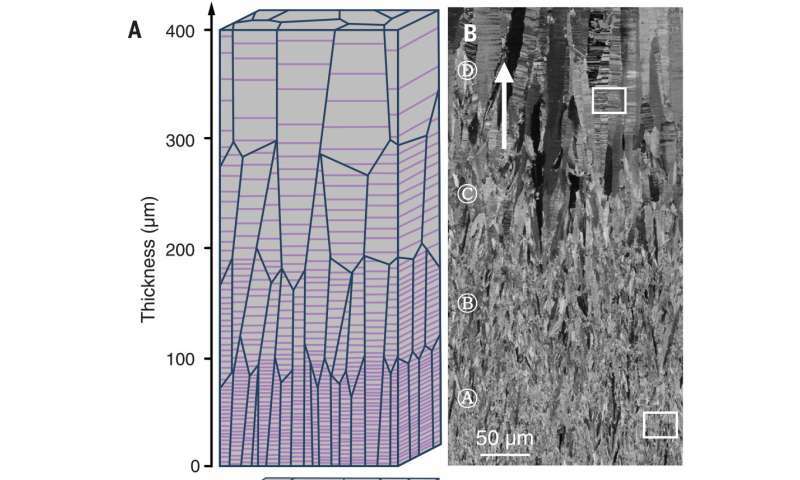 Researchers from Brown University and the Institute of Metals Research at the Chinese Academy of Sciences have found a new way to use nanotwins—tiny linear boundaries in a metal's atomic lattice that have identical crystalline structures on either side—to make stronger metals. In a paper in the journal Science, the researchers show that varying the spacing between twin boundaries, as opposed to maintaining consistent spacing throughout, produces dramatic improvements in a metal's strength and rate of work hardening—the extent to which a metal strengthens when deformed. Huajian Gao, a professor in Brown's School of Engineering who co-led the work, says the research could point toward new manufacturing techniques for high-performance materials. "This work deals with what's known as a gradient material, meaning a material in which there's some gradual variation in its internal makeup," Gao said. "Gradient materials are a hot research area because they often have desirable properties compared to homogeneous materials. In this case, we wanted to see if a gradient in nanotwin spacing produced new properties." Gao and his colleagues have already shown that nanotwins themselves can improve material performance. Nanotwinned copper, for example, has shown to be significantly stronger than standard copper, with an unusually high resistance to fatigue. But this is the first study to test the effects of variable nanotwin spacing. Gao and his colleagues created copper samples using four distinct components, each with different nanotwin boundary spacing. Spacings ranging from 29 nanometers between boundaries to 72 nanometers. The copper samples were comprised of different combinations of the four components arranged in different orders across the thickness of the sample. The researchers then tested the strength of each composite sample, as well as the strength of each of the four components. The tests showed that all of the composites were stronger than the average strength of the four components from which they were made. Remarkably, one of the composites was actually stronger than the strongest of its constituent components. "To give an analogy, we think of a chain as being only as strong as its weakest link," Gao said. "But here, we have a situation in which our chain is actually stronger than its strongest link, which is really quite amazing." Other tests showed that the composites also had higher rates of work hardening than the average of their constituent components. To understand the mechanism behind these increases in performance, the researchers used computer simulations of their samples' atomic structure under strain. At the atomic level, metals respond to strain through the motion of dislocations—line defects in the crystalline structure where atoms are pushed out of place. The way in which those dislocations grow and interact with each other is what determines a metal's strength. The simulations revealed that the density of dislocations is much higher in the gradient copper than in a normal metal. "We found a unique type of dislocation we call bundles of concentrated dislocations, which lead to dislocations an order of magnitude denser than normal," Gao said. "This type of dislocation doesn't occur in other materials and it's why this gradient copper is so strong." Gao said that while the research team used copper for this study, nanotwins can be produced in other metals as well. So it's possible that nanotwin gradients could improve the properties of other metals. "We're hoping that these findings will motivate people to experiment with twin gradients in other types of materials," Gao said. How to calcualte the thickness of a wall of a dewar? Thermodynamics in an ion beam? Clear chemical or material that will absorb or deflect IR? Now we just need to see if someone can use this stuff in a "forged in fire" episode to make a "signature blade"! I jest of course, but the point is how hard will it be to produce this material in practical quantities for practical applications? And once created, how hard will it be to actually make something out of it? Even if diamond could be produced for free, turning it into a hunting knife would remain a truly difficult endeavor. Well P, I lack the experience to comment about ysing these nanoalloys for forging a blade. However, if these nanomaterials can communicate? and in the darkness bind them."